In a time when the Australian political debate has converged on this issue of gay marriage, we should examine the reasons that people have raised in their protest against gay marriage. The methodology behind this article is based on social psychology (and therefore science) rather than law or religion. It argues for 10 reasons why gay marriage should be allowed in Australia. 1. To say that gay marriage is wrong because marriage laws dictate it, is flawed reasoning. Since 2004, Australian law states that "marriage means the union of a man and a woman to the exclusion of all others, voluntarily entered into for life". This law needs to be changed. The majority of people who voted in a recent Sydney Morning Herald article think so. Do we or do we not have a democracy? Laws are supposed to be helpful. a. The current law may not be right for all. Using it to defend the anti-gay marriage cause is a circular device. It's like when someone asks "Why is that" and you reply "Because I said so"
b. Laws are meant to exist for the benefit of mankind. A law against murder and theft for example are pro-life and pro-respect and ensure that people are protected from harm. But a law against gay couple marriage is not pro anything. Who benefits from it? Who does it help? No one. In fact it hinders people who genuinely love each other from advancing as easily as other couples on the sole basis of their gender constitution. The current law is depriving some couples who feel love for each other on the basis that 'it is the law' but for no other valid reason. It therefore needs to be changed for the good of humanity. Some countries, including Spain, Canada and The Netherlands have already done that. 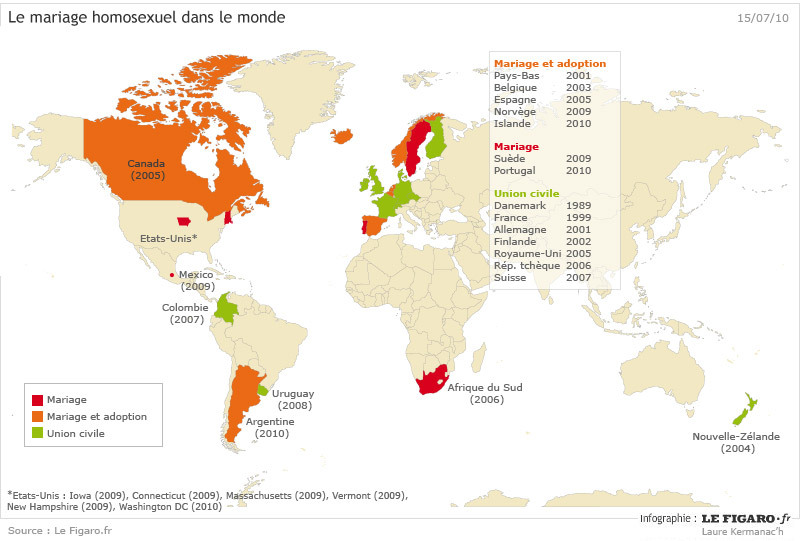 This map from French newspaper, Le Figaro, shows the current gay marriage, gay civil union and adoption laws in the world. Let's face it, Australian laws today are based on the old Judeo-Christian laws. To repeat this archaic nonsense is the equivalent of repeating that "a woman should be stoned for adultery." Culture is changing. What is right or wrong has changed over the years. Nothing is by definition "normal". About 110 years ago, Oscar Wilde was sentenced to hard labour for 2 years. He was made to labour on the treadmill until he was wasted. Why? He was charged with gross indecency because he was gay. Today in countries where homosexuality is legal, including Australia, we would cringe at the thought of Oscar Wilde's treatment. How could they do this to him? Yes, only about 110 years ago, the English judicial system did this to Oscar Wilde because the culture and times were conducive to this mentality. Because it was normal. Today the English judicial system would behave very differently. This is proof that in matters of sexuality, our mentality evolves. Culture and social beliefs are evolving today and to say that something is not normal is not a valid argument for denying gay couple the right to marry because 'normalcy' relies on a temporary belief system. Marriage in terms of the Judeo-Christian definition allowed a man and woman to procreate and make children. In those days, marriage necessitated a male party and a female party - to assist in procreation. But today the fact that a male and female party are no longer a necessity for a couple to arrive at children is the very thing that puts into question the definition of marriage. Medical and scientific advances together with the large departure from traditional religious fervour in Western marriages means that couples can resort to any of sperm donations, in-vitro fertilization and adoption to have children. Heterosexual couples use these advances and do not believe it is wrong. What this means is that the definition of marriage should no longer be limited by traditional procreation considerations. Latest 2010 research indicates that children adopted by gay or lesbian parents develop as well as those adopted by heterosexual couples. This is a social fallacy. Basically, it asserts that a man will say, teach his son how to paint a house and a woman will teach her daughter how to bake a cake. This is a crass example but these stereotypes are real. In a nutshell, this gender role belief asserts that in a couple, the male is required to fulfill his male gendered role expectations and the female is required to fulfill her female gendered role expectations and that both are necessary for their child to thrive. But in the first place, gender roles are nothing but cognitive shackles that have been imposed on individuals as a result of social expectations and beliefs. A heterosexual man often behaves a certain way because over many years, social norms, social expectations, and his desire for male integrity have taught him to behave this way. Similarly a female is highly influenced by social norms herself. If we are to grow as human beings, and raise similarly free human beings, we must rid ourselves of shackles that limit us. Regardless of our sexual orientation. Our society is in fact slowly evolving in this way and this is why gender roles no longer have a place. Luckily for gay couples, who already have faced an internal struggle with who they are or should be according to society and who already feel comfortable with being their true selves regardless of expectations, the ability to behave in a traditionally male or traditionally female way is just a matter of choice rather than convention. If anything, gay couples have a supreme advantage of not being limited by social convention and of moving with fluidity between roles. They therefore can arguably be best equipped to raise a child. Wouldn't you think? But even so, biological gender limitations may still exist, you say. After all, not everything is determined by environment. Some individual attributes are the product of nature. Indeed, while there is scientific evidence that in general, women are better at multitasking and that in general, men are better at finding their way around a maze, these biological gender variations are hardly significant factors in terms of child rearing. So in the worse case scenario, little Mary is going to be raised by two women who get lost regularly. So what? The most laughable argument against gay marriage/child adoption is that it is a form of abuse to children involved. There is no scientific evidence in favour of this. Studies by developmental psychologists have demonstrated that for a child to thrive emotionally, physically and be attached securely to their parents, they need emotionally responsive and attuned carers. In no way does gender come into the picture. One can't begin to rave enough about the real child abuse perpetrated all over the world by heterosexual couples. Let's not go there. Anyone who believes that children of heterosexual couples are the happiest creatures on earth is obviously out of touch with reality. Let's say that again. It is against human rights. It's like saying Black people are not allowed in the Club. Black is a color that can not be changed in the same way as sexual orientation is a human facet that can not be rigidly controlled or made to change to suit the 'majority'. The Club allows a group of people to be recognised as 'belonging to the club', it gives them access to various Club rights. It allows those who are in the Club to be seen by all others in the Club as being permitted to join the Club. The Club, in its most abstract form is in fact the very definition of marriage. We would not turn away a non-White person from any venue today, would we? It would be against human rights. In the same way, refusing gay couples from the right to marriage infringes on human rights. There are some who think that any two people of the same gender can band up and reap up the family / couple benefits acquired by law by pretending to be enamored of each other. It's a fear. The fear that supposedly dishonest gay couples will take advantage of welfare or will benefit from government benefits intended for genuine couples. This fear is not a valid argument against Gay Marriage. The ability to take advantage of the system is alive and well in heterosexual couples. Some heterosexual couples who are happily living together for years suddenly decide to get married because it helps them in one way or another. Most heterosexual couples are happy to use 'the system' and understand how the government can help them, their family, their children whether financially or in any other way. It is human nature to want as much as possible for one's family. Of course we want to use the system. Did any Australian heterosexual couple ever spit on the Baby Bonus granted to Australian mothers? Hell no. Take it. Take it all. Pop those babies while you can still reap the rewards. Some women even began scheduling their child's birth to take advantage of the rise in the baby bonus. Yes, we know who you are. Sad really. But gay couples can hardly be accused of anything that a heterosexual couple wouldn't do. Therefore this argument is not valid. 10. Saying "Who Cares" and "What's the Big Deal" is not a valid argument against gay marriage. So yes it might not be a big deal. Perhaps gay couples could just live as happily without getting married. And perhaps if they don't want children, and some couples don't, all this is really not a big deal. But "It's not a big deal" is an easy statement to make when you are not discriminated against. There is a principle used in marketing which has strong psychological support. It is a principle whereby, whenever items are banned / restricted or limited they suddenly become very attractive. As a result, many people desire these forbidden items. It's not childish, it is a human behaviour that has its roots in the scarcity of resources. Of course heterosexuals don't think it is a big deal. Marriage is there, it's available to them. They can get married easily without restrictions. So of course, it's not a big deal to them. But if it were a restriction, if it were forbidden, who knows how badly they might want it.